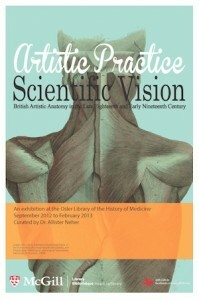 The exhibition catalogue for our current exhibition, “Artistic Practice Scientific Vision: British Artistic Anatomy in the Late Eighteenth and Early Nineetenth Century,” curated by Dr. Allister Neher is now online! This vivid exhibition explores the intersection of art and anatomy in late eighteenth and early nineteenth century Britain. Medical students and art students of the period frequented the same milieux, as aspiring doctors studied drawing at places like London’s Royal Academy of Arts and young artists studied anatomy at private medical schools. Be sure not to miss the exhibition in person, on through the end of February. January 30th is World Leprosy Day. Observed either on this day or the nearest Sunday, the day is designed to raise public awareness of leprosy, historically one of the most stigmatized illnesses. Portrait of Gerhard Henrik Armauer Hansen (1841-1914), a Norwegian physician best known for identifying Mycobacterium leprae, the bacterium that causes leprosy, or Hansen’s disease. 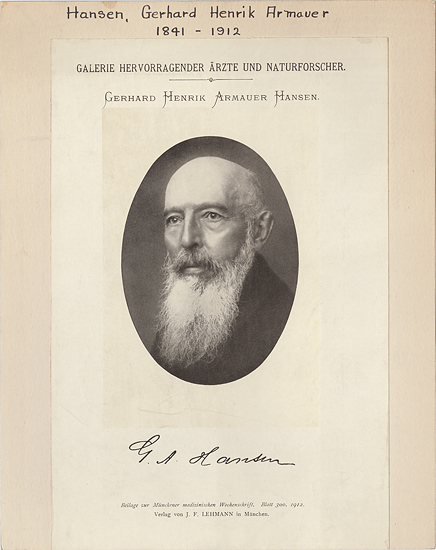 (Munich: J. F. Lehmann, 1912.) From the Osler Library Prints online. Although leprosy was officially eliminated more than a decade ago, the disease has not been completely eradicated and the scars from the past linger on. Iran, with an annual incidence of less than 100 cases, is among the regions in which strategies recommended by WHO have been implemented successfully thanks to the availability of free multidrug therapy and leprosy elimination campaigns. Boeckl, Christine. Images of leprosy: disease, religion, and politics in European art. Kirksville, Mo. : Truman State University Press, 2011. Liang, Qizi. Leprosy in China: a history. New York : Columbia University Press, 2009. Rawcliffe, Carole. Leprosy in medieval England. Woodbridge, UK ; Rochester, NY : Boydell Press, 2006. Demaitre, Luke. Leprosy in premodern medicine: a malady of the whole body. Baltimore : Johns Hopkins University Press, 2007. Or take a virtual tour of New Brunswick’s 19th century leper hospital here. Between 1844 and 1949, 327 patients with leprosy were housed and treated at this lazaretto. New Year’s resolutions already a distant memory? The Centre for Medical Humanities at Durham University in the UK is giving readers of their blog a preview of Louise Foxcroft’s recent book, Calories and Corsets: A History of Dieting Over 2000 Years. Calories and Corsets tells the epic story of our complicated relationship with food, the fashions and fads of body shape, and how cultural beliefs and social norms have changed over time. Combining research from medical journals, letters, articles and the dieting bestsellers we continue to devour (including one by an octogenarian Italian in the sixteenth century), Foxcroft reveals the extreme and often absurd lengths people will go to in order to achieve the perfect body, from eating carbolic soap to chewing every morsel hundreds of times to a tasteless pulp. Read a review of this book from The Lancet, available to McGill users here. Ready for chapter 2? Find the book in our catalogue here. Welcome to the new Osler Library blog. Our goal is to provide you with a new way of receiving news and updates of goings-on at Osler, news in the world of history of medicine and medical humanities, and tips and tricks for researchers and students in related fields here at McGill.